Juan (or Capitan Juan as he was called) Mercado was born in Biñan, Laguna, Philippines. His parents were Francisco MERCADO and Bernarda MONICA. He married Cirila ALEJANDRA. at the age of 22. Juan died in 1826. Cirila Alejandra was a Chinese Mestiza, daughter of one of Domingo Lam-co’s godsons, and who hailed from Tubigan. Her parents were Juan SIONG-CO (Syongco) and Maria CONIO of Biñan. Juan and Cirila had 13 children. They lived in large house made of stone in the center of Biñan. (One of his children, Francisco Engracio, born in Biñan sometime in April 1818 was the father of Jose Rizal). Like his father, Juan Mercado also served as the town’s capitan del pueblo (gobernadorcillo of Biñan) in 1808, 1813, and 1823. On many occasions, “Capitan Juan”, as his town mates referred to him, was the hermano mayor in religious and social affairs. Like his wife, he was benevolent and hardworking. His status earned him the privilege of electing the Philippine representative to the Spanish parliament in 1812. After Mexico became independent in 1821, Spain took over direct control of the Philippines. It had been governed by the Virreinato de Nueva España or Viceroyalty of New Spain (Mexico). Coinciding with the advent of steamships and the consequent expansion of the global economy, the Spaniards decided to open up the Philippines to foreign trade. As the subsistence economy shifted to an export crop economy, in 1834 the Spanish allowed both non-Spanish Westerners and Chinese immigrants to settle anywhere in the islands. The mestizos de sangley largely abandoned wholesale and retail trading altogether. They converted their capital into larger landholdings, and cultivated sugar plantations for a commodity crop for the new export market, particularly in Central Luzon, Cebu, Iloilo and Negros. The mestizos de sangley took advantage of the rapid changes as the colonial economy was integrated into the markets of the Western world. Many prominent mestizo de sangley families belonging to the landlord class acquired vast landholdings during this period. Their holdings were second only to those of the Catholic religious orders, who owned the most land in the Philippines. As landholders, the mestizo sangleys acquired more power than they has in their economic role as colonial merchants of the Spanish Colonial Period. The middleman role became filled chiefly by new Chinese immigrant traders. In the years to come, mestizo sangleys in the countryside became a kind of feudal power. In the 19th century, the population of mestizos de sangley grew rapidly over the years as more Chinese male immigrants arrived, converted to Catholicism, settled in Binondo and intermarried with indio or mestizo de sangley women. With no legal restrictions on their movement, mestizos de sangley migrated to other areas in the course of work and business, such as Tondo, Bulacan, Pampanga, Bataan, Cavite, Cebu, Iloilo, Samar, Capiz, etc. The number of unconverted sangleys dropped from a high of 25,000 prior to the First Great Massacre of 1603 to below 10,000 by 1850. From 1810-1894, the population figures for the Philippine islands were as follows:. With the continuous expansion of Metro Manila, the city of Biñan is now included in Manila built up area which reaches Lipa City, Batangas in its southernmost part. Biñan City is also part of the new metropolitan area of the province of Laguna, known as Laguna West Metro. 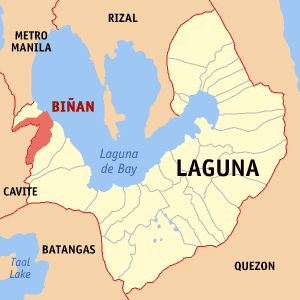 The City of Biñan is located in the Philippine province of Laguna, about 34 kilometers south of Manila. 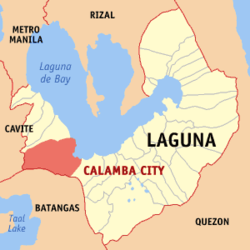 It is bounded on the north by San Pedro on the south by Santa Rosa City and on the west by Carmona, Cavite. On the eastern and northern horizon lies the Laguna de Bay, the largest lake in the country. and sister continued to make their home there. Juan Mercado died when his son, Francisco Engracio Mercado, was only eight years old. With his sisters and brothers, Francisco Engracio helped his widowed mother in managing the family’s business. Francisco, in spite of his youth, became a tenant of the estate as did some others of his family, for their Binan holdings were not large enough to give farms to all Captain Juan’s many sons. The landlords early recognized the agricultural skill of the Mercados by further allotments, as they could bring more land under cultivation. Sometimes Francisco was able to buy the holdings of others who proved less successful in their management and became discouraged. The pioneer farming, clearing the miasmatic forests especially, was dangerous work, and there were few families that did not buy their land with the lives of some of its members. In 1847 the Mercados had funerals, of brothers and nephews of Francisco, and, chief among them, of that elder sister who had devoted her life to him, Potenciana. She had always prompted and inspired the young man, and Francisco’s success in life was largely due to her wise counsels and her devoted encouragement of his industry and ambition. Her thrifty management of the home, too, was sadly missed. He married Teodora Alonso Realonda de Quintos, a daughter of one of Manila’s most distinguished families in 1848. Teodora Alonzo was the daughter of Lorenzo Alberto Alonzo and Brigida de Quintos . Lorenzo was described as “very chinese” in appearance. Brigida was the daughter of Manuel de Qunitos, a Manila attorney whose family were Chinese Mestizos of Pangasinan. It is said that Doña Teodora’s family descended from Lakandula, the last native king Tondo. Her great-grandfather, Rizal’s maternal great-great-grandfather, Eugenio Ursua (of Japanese ancestry), who married a Filipina named Benigna (surname unknown). Their daughter, Regina, married Manuel de Quintos, Filipino-Chinese lawyer from Pangasinan. One of the daughters of Atty. Quintos and Regina was Brigida, who married Lorenzo Alberto Alonso, a prominent Spanish-Filipino mestizo of Biñan. Their children were Narcisa, Teodora (Rizal’s mother), Gregorio, Manuel, and Jose. Sometime after 1849, in compliance with Governor Claveria’s decree ordering Filipinos to adopt Spanish surnames (to facilitate documentation, for, many Filipino families shared the same family name such as “De La Cruz”, etc.) Francisco adopted the surname “Rizal” (originally Ricial, the green of young growth or green fields), which was suggested to him by a provincial governor, or as José had described him, “a friend of the family”. However, the name change caused confusion in the business affairs of Francisco, most of which were begun under the old name. After a few years, he settled on the name “Rizal Mercado” as a compromise, but usually just used the original surname “Mercado”. Francisco moved his family to Calamba, where he farmed lands leased from the Dominican friars, growing sugar cane, rice and indigo. He also started a mixed orchard engaged in trade, raised poultry, in all of which he was assisted by his wife Teodora. In time, Franciso’s family became one of the wealthiest in Calamba. Francisco changed his surname to Rizal to avoid being implicated in the 1872 Cavite Mutiny, as his son, Paciano Rizal Mercado,, was a student of Fr. Burgos. i. Saturnina (Neneng) (1850–1913), She was married to Manuel T. Hidalgo, a native and one of the richest persons in Tanauan, Batangas. She was known as Neneng..
vi. José Protasio (19 Jun 1861 Calamba, Laguna–1896) soon to become José Rizal He was classified as mestizo de sangley due to his Chinese ancestry, although he also had Japanese and Spanish ancestors. He is famous for asking to classified as indio prior to his execution. In 1849, the then Governor-General of the Philippines, Narciso Claveria, issued a Decree by which native Filipino and immigrant families were to adopt Spanish surnames from a list of Spanish family names. 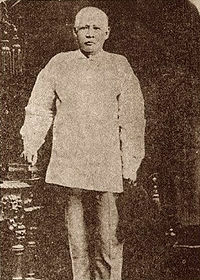 Although the Chino Mestizos were allowed to hold on to their Chinese surnames, Lam-co changed his surname to the Spanish “Mercado” (market), possibly to indicate their Chinese merchant roots. 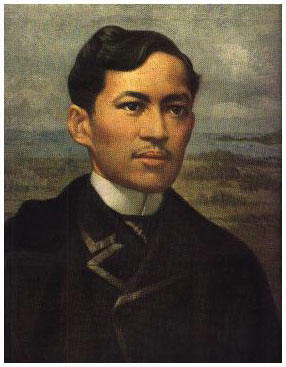 José’s father Francisco adopted the surname “Rizal” (originally Ricial, the green of young growth or green fields), which was suggested to him by a provincial governor, or as José had described him, “a friend of the family”. However, the name change caused confusion in the business affairs of Francisco, most of which were begun under the old name. After a few years, he settled on the name “Rizal Mercado” as a compromise, but usually just used the original surname “Mercado”. Upon enrolling at the Ateneo Municipal de Manila, José dropped the last three names that make up his full name, on the advice of his brother, Paciano Rizal Mercado, and the Rizal Mercado family, thus rendering his name as “José Protasio Rizal”. Of this, Rizal writes:“My family never paid much attention [to our second surname Rizal], but now I had to use it, thus giving me the appearance of an illegitimate child!” This was to enable him to travel freely and disassociate him from his brother, who had gained notoriety with his earlier links with native priests who were sentenced to death as subversives. When you write to my brother, address him Paciano Mercado . . . After the sad catastrophe (1872), he had to leave the university since he was a liberal and the friars did not like him because of his having lived with Burgos. At that time, I had to go to Manila to study, and in order not to have difficulties in my studies, I was advised to use our second name, Rizal. For some time, I am the only Rizal because at home my parents, my sisters, my brother, and my relatives always preferred the old surname Mercado. Our father’s name was in effect Mercado; but in the Philippines there are many Mercados who are not our relatives. There was an alcalde, a friend of the family, who used our name Rizal. My family, however, did not mind this, because even now I alone use the name. Accordingly, does it not appear as if I were an illegitimate son? My father and all my family remain valiantly united permanently loyal to the Filipino party, and my brother is much braver in exile than he was before. My whole family now carries the name Rizal instead of Mercado because the name Rizal signifies persecution. Good. I want also to stick with them and be worthy of the name of the family. . . .. This entry was posted in -7th Generation, Socorro. Bookmark the permalink. Did anyone from the Mercado Family ever migrate to the Dominican Republic.